uniPAVEMENT was developed to improve the existing pavement management process. Our goal was to streamline the methods of determining the appropriate rehabilitation and maintenance strategies. 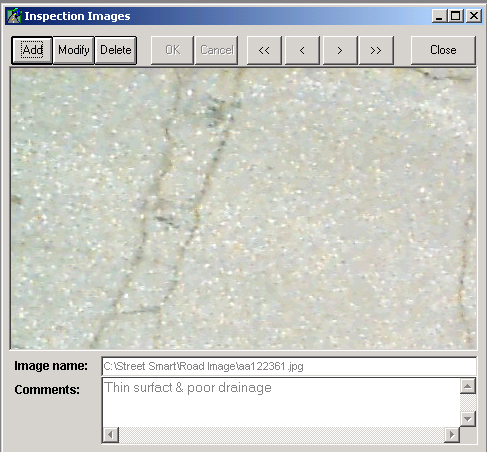 uniPAVEMENT achieves this by using objective distress data and customizable Decision Tree features. When these Decision Trees are defined in greater detail, increased savings will be identified. The results can be seen and edited directly on a digital street map, without needing to link to a GIS program. In addition, uniPAVEMENT displays a complete inventory of asset information on an interactive GIS map, which is shown in figure 1. Figure 1. Sample screen shots of interactive GIS map. uniPAVEMENT provides up-to-date and future pavement conditions of each individual section. Adhara Systems has introduced a revolutionary new algorithm that relates the results from the current survey to the history of maintenance activities. 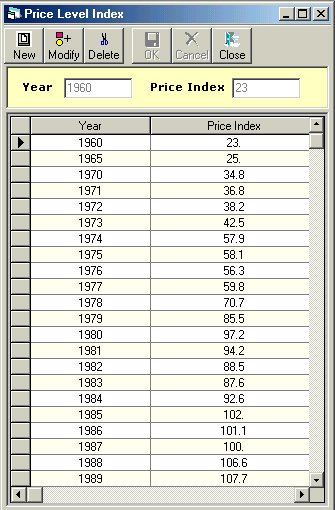 A chart can be displayed that plots the actual condition level (or a predicted condition level) along with the targeted condition level (set by the user) for each year. uniPAVEMENT also provides a user-configurable deterioration model if the user does not have enough historical data to define deterioration rates for each road segments. 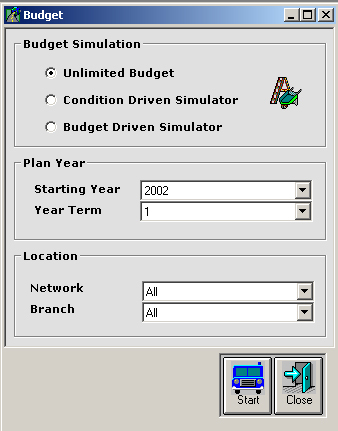 Figure 2 shows predicted performance graph and user-configurable deterioration model dialog box. Figure 2. 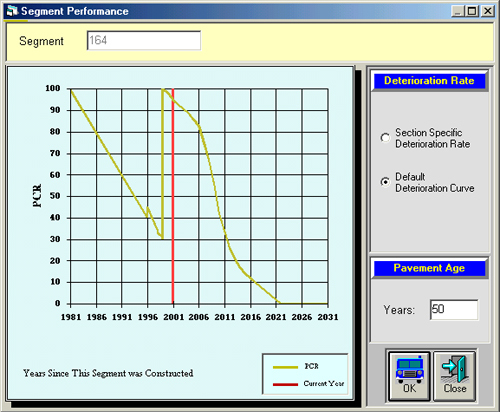 Screen shots of predicted performance graph and a user-configurable deterioration model dialog box. For pavement performance analysis, uniPAVEMENT uses individual distress data for each segment of pavement, as well as a combined index for the whole network. This process provides the user with more accurate results during calculations of pavement performance analysis and budget analysis. 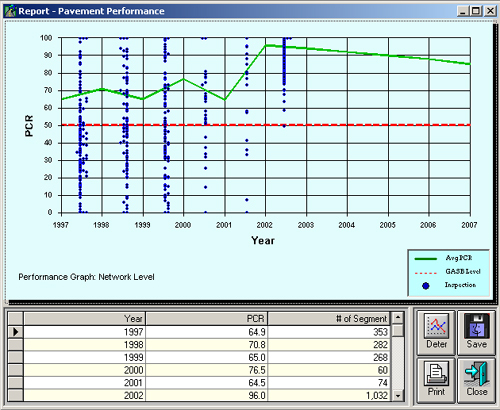 Figure 3 shows Performance Graph and condition Assessment dialog boxes. Figure 3. Performance Graph and Condition Assessment History. The results of the budget analysis are easy to forecast and understand because a separate budget is assigned to each repair method. 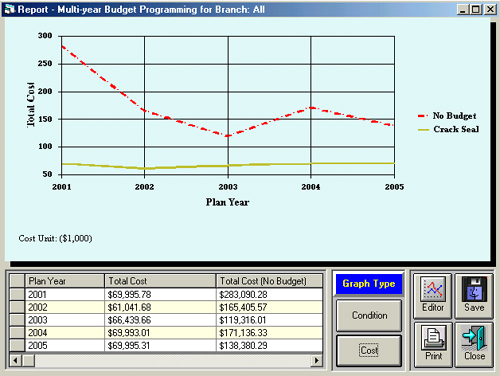 Budget Scenario helps users develop maintenance and repair strategies. Users are allowed to decide the total cost of repairs to conduct maintenance of pavement. Budget Needs help users view the total amount of money that needs to be allocated for each maintenance (or repair) method. This tool illustrates how the condition of roads deteriorates within specified years depending on the selected budget scenario. Figure 4. Budget Analysis through a GIS map. 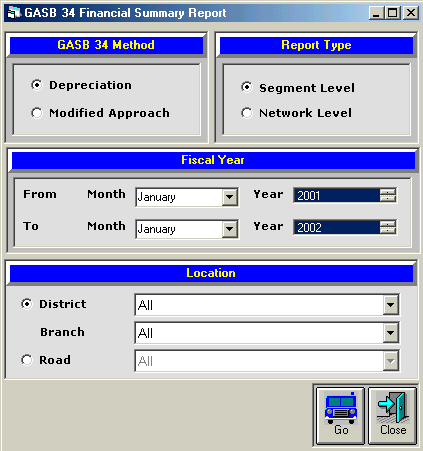 GASB34 compliance is a strong feature of the documentations and reports within the uniAMS product suite. uniPAVEMENT presents a clear picture and offers the opportunity to report the depreciation cost and the actual costs that are incurred each year to maintain the quality of pavement. Documentation is provided that will help you maintain compliance with the Depreciation Method or the Modified Approach Method. Figure 5. 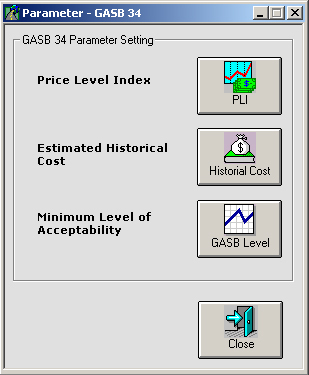 Price Trend Information and GASB report. Modified Approach Method: Governments can avoid the Depreciation Method by using the Modified Approach method. To satisfy this approach, the government must use an asset management system with specific and defined characteristics, and provide documentation that the assets are being preserved at or above an established condition level. 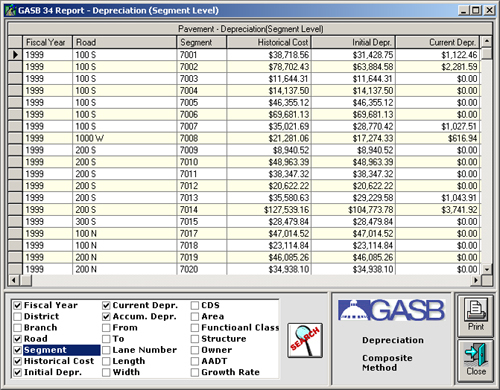 Depreciation Method: Governments will be required under the new financial reporting model to report capitalized costs (historical or estimated) and their depreciation expenses for all of their capital assets, retroactively, including general infrastructure assets acquired or repaired since June of 1980. The Adhara Systems' Pavement Asset Management System enables uniPAVEMENT to meet GASB 34 requirements for Pavement Assets. uniPAVEMENT is an easy-to-use decision-making system that is designed to help local governments effectively manage their pavement assets through optimal road maintenance budgeting, maintenance scheduling, and powerful data management. 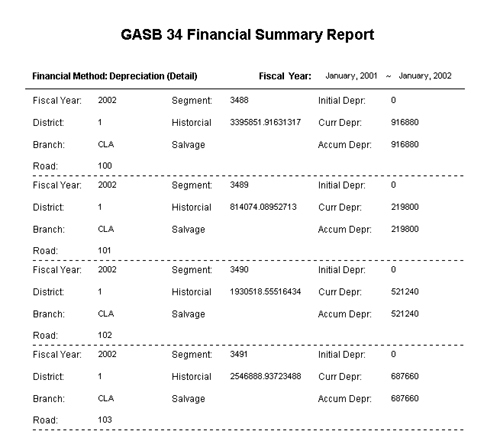 uniPAVEMENT features several different reporting options, all of which provide documentation that can be used in demonstrating GASB 34 compliance. Have an up-to-date inventory of eligible infrastructure assets. Solution: uniSURVEY is the fastest and most objective way to update inventories. 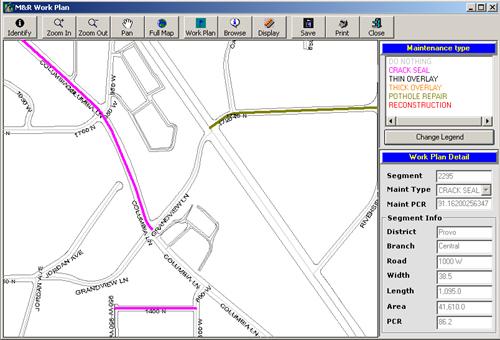 uniPAVEMENT is automatically updated and is easily edited with changes. uniPAVEMENT and uniSURVEY seamlessly interface with each other. Inventories can be updated on the fly, eliminating the need to repeat work or outsource an incremental inventory, consequently saving time and money. Condition assessments are summarized using a standard basis of measurement and measurement scale. Solution: uniSURVEY is the only complete software system that uses an objective means of measurement (Digital Image Analysis). uniSURVEY's objectivity ensures that even measurements that are taken with different equipment will reach virtually identical results every time. Estimate annually the required budget to maintain and preserve the public infrastructure at the condition level established and disclosed by the government. Solution: uniPAVEMENT automatically estimates the annual costs to maintain and preserve infrastructure assets and provides reports to document the results. Charts can easily be created which compare the "anticipated to actual" expenses and the trends of network conditions compared to disclosed level set by the government. Complete condition assessments of eligible infrastructure assets must be performed in a consistent manner every three years. 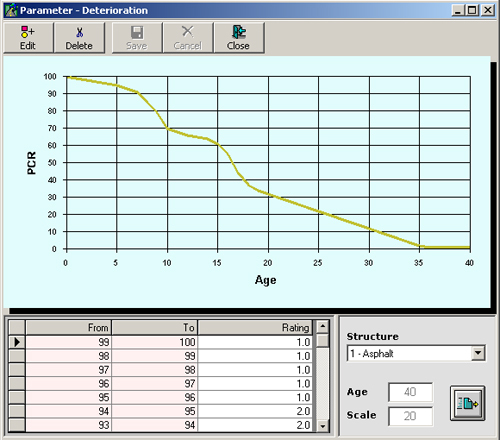 Solution: uniSURVEY is able to collect objective and accurate condition assessments at a user-defined interval. SDSA can lower costs by statistical sampling. After establishing a complete database you can divide future assessments through uniSURVEY's intuitive map interface. 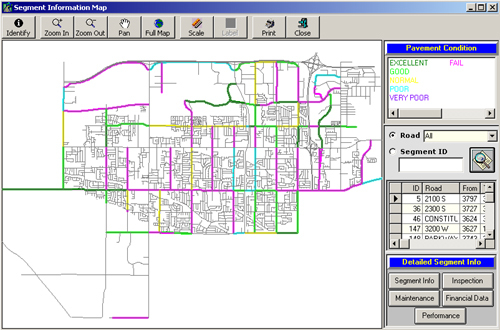 uniPAVEMENT allows the user to sort and filter data in a variety of ways, (by districts, branches, range of condition, or repair methods, etc.). You can divide subsequent inspections by focusing on parts of the city each year, ultimately completing the rounds every three years. The condition level can be determined by both the condition index and the percent of network in each condition category. The results of the three most recent complete condition assessments provide reasonable assurance that the eligible infrastructure assets are being preserved approximately at (or above) the condition level established and disclosed by the government. Cities with less than $10 million in total annual revenues are exempt from retroactive reporting. Solution: The retroactive requirement can be met by entering the available maintenance history into uniPAVEMENT. uniPAVEMENT will extrapolate the pavement's condition from the history information up to the current assessment. Using the inspection and maintenance history data, uniPAVEMENT plots the future trends of the pavement condition. 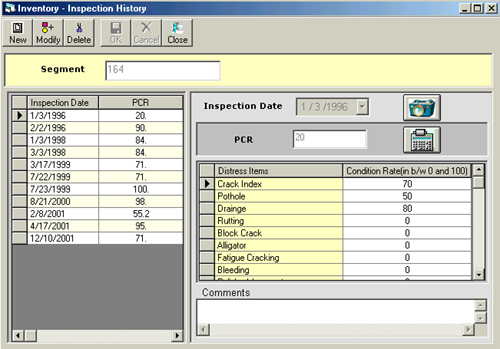 The "established and disclosed" condition level, actual condition level, and predicted condition level for each year and displayed on a chart. Trends are then easy to see and account for. GASB 34 requires that a government "establish a historical cost for the asset, less its estimated salvage value; then depreciate the asset". 2. Record, analyze, and report the value of an asset through its entire useful life. 3. 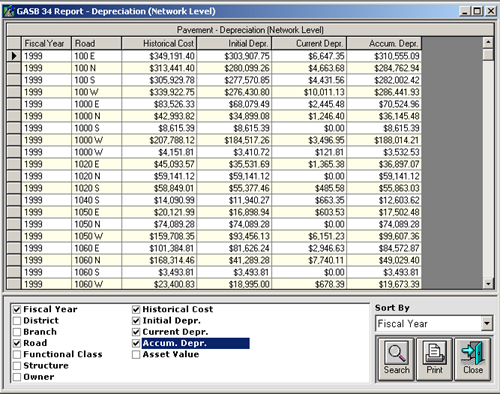 Report the depreciation and historical cost of your assets in your financial statement.